The Holiday Inn Amman, with wide open vistas and spacious grounds, is within a short distance to the capital's business and commercial areas with easy access to Queen Alia International Airport. 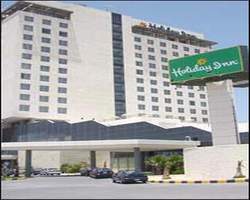 The Holiday Inn Amman has 240 guest rooms, including 18 suites and 20 executive bedrooms. Modern amenities include in-room climate control, color television with multiple satellite channels, hairdryer, bath and shower, and safety deposit box. Non-smoking rooms and facilities for the disabled are also available. The Holiday Inn hotel features to several restaurants, catering to every taste and discerning palate for casual or special occasional dining. "The Senate" all day dining serves both local and western dishes in rich buffet or "à la carte" style. "Capuccino Café" offers Amman's best tasting cappuccino specialities as well as a cooler menu of ice creams and home made pastries. "Beyond Rangoon" offers the finest Thai and classical Chinese cuisine in an unforgettable setting. Large multi-purpose hall accomodates up to 1000 persons, divisible into three, with area. 3 Meeting rooms accomodate up to 25 persons each. The Ballroom with a grand private entrance and spacious pre-function hall can accomodate up to 1000 persons for a big conference, a lavish wedding reception, an exhibition, or a unique seminar. For smaller groups our boardroom and meeting rooms are ideal. Take a dip in the cool blue water of our outdoor double haxagon pool. Order an assortment of light snacks, fresh juices or a frosted glass from a complete range of drinks at our pollside terrace.